Anna Gav is an European artist/designer from Helsinki, Finland. Anna established a fashion company that designs, manufactures and distributes fashion jewelry under the registered EU trademark of ANNA GAV Jewelry in Helsinki, Finland. Anna started creating her first jewelry and art when she was only 10 years old. The largest inspiration for Anna was the story of the legendary Coco Chanel. Anna dreamed of becoming an artist/designer to inspire people to achieve their life goals and add joy to their lives. Anna Gav started an experimental research program focusing on the unconscious power of thought, cognitive psychology and neurophysiology. She investigated how art, fashion and color-messages influence our daily life and affect our behavior and well-being. Anna studied philosophy, psychology, neurophysiology and art. This was applied to the likes of Sigmund Freud, Carl Jung, Daniel Kahneman, René Magritte, Salvador Dalí, Maurits Cornelis Escher, Pablo Picasso, Wassily Kandinsky and others who worked on the unconscious mind. Anna Gav gathered a group of approximately 1,500 loyal, repeat customers for her research program to study the desire to be attractive from a woman’s perspective. As a result several tools were adopted for developing self-knowledge and self-motivation: expression of unconscious art, psychometric mind-mapping, color analysis, encryption of ambitious desire by oil on canvas and more. 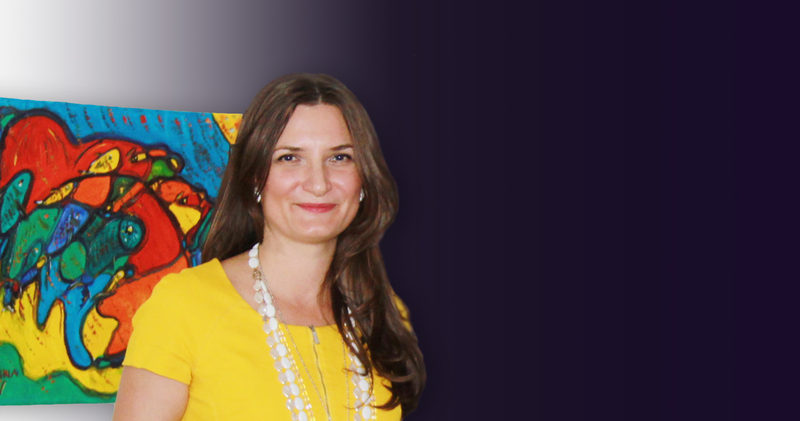 Anna believes that art influences and inspires our daily life, helping us to achieve goals and happiness. The inspiration to do collaborative art reflects Anna’s life. Anna’s own experience is that powerful thoughts can guide and shape our lives. Anna Gav developed her own method of color analysis. This reflected ten years experience in working with European customers in designing and producing fashion and art. Color analysis has become an essential part of the broader psychometric mind-mapping process. It is based on many years of private research on human nature. Custom tailored colors will match the unique physiology, horoscope and zodiac signs, region of residence, age, etc. Color is a crucial part of the message that we send to the people around us. The fact is that the colors in your interior environment can influence your life! It can bring different emotions to the surface. Color in artworks affects your mood and the people around you. Interior design or fashion choice can elicit feelings of comfort, happiness, excitement and self-confidence. Certain color choices can even enhance your sexuality and improve your health. For each person there is a unique set of colors that corresponds to their inner nature and unconscious mind and which serves as a color code to the world. The correct selection of colors can assist you toward achieving your life-goals and subconsciously influence people around you to make it happen. Anna Gav presented an art project based on cognitive psychology and neurophysiology called “Ambitious Art” or “Encryption of Ambitious Desires or Dreams on Canvas”. Anna developed a unique method based on psychometric mind-mapping to combine colors and symbols using color analyses and the Fibonacci sequence. The artworks presented were abstract and figurative oil paintings on canvas. Since 2017, co-creation artworks have been successfully completed with customers from England, Finland, Norway, Spain and Russia. Seize the opportunity to have a remarkable art experience. Order your custom-made painting and add a beautiful piece of art to start or supplement your private collection. The customized painting in collaboration with an artist may also be the perfect gift for a loved one.